Cobb salads are always one of my go-tos when ordering a lunch salad at a restaurant — I love a good Cobb Salad! So I’ve combined all of my very favorite ingredients I’ve had in past cobb salads to bring to you my take on an ultimate Cobb Salad. So first off, a What is a Cobb Salad? it’s a main-dish American garden salad and typically has lettuce, veggies, hard-boiled eggs, avocado, cheese, chicken, avocado, cheese, and either a vinaigrette or a bleu cheese dressing. But nowadays there are hundreds of variations on this salad including the one I’m sharing today. Also if you’re wondering about the difference between a cobb salad and a chef’s salad, the two are very similar as they both have lettuce, cheese, and meats (typically bacon, chicken breasts, and/or ham), and hard-boiled eggs. 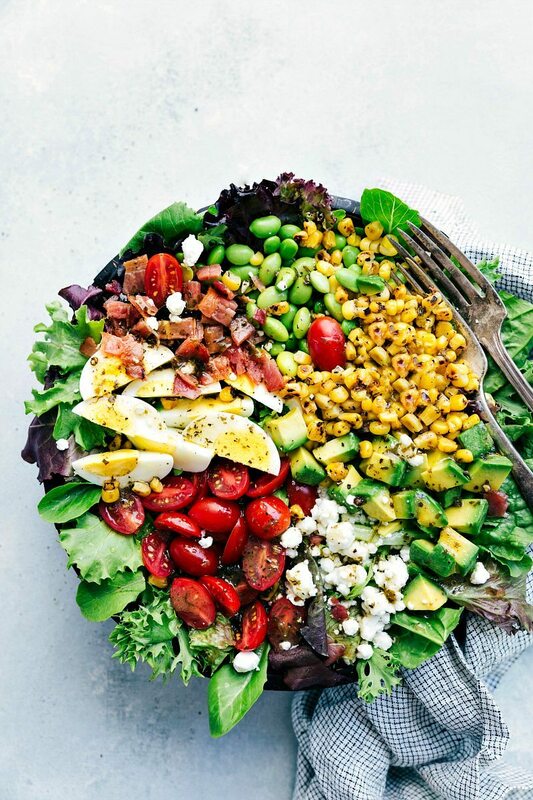 However, a Cobb salad usually also has avocados and tomatoes. (More history on the differences of the two salads can be found here). 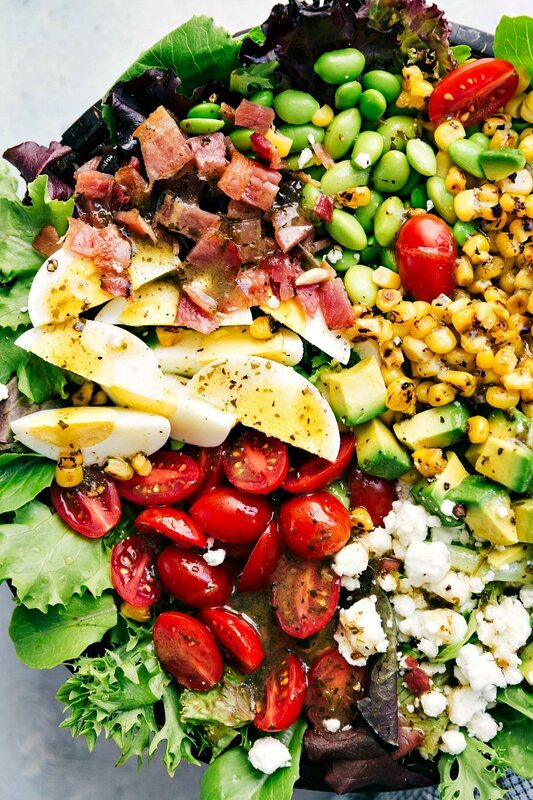 Is Cobb salad good for you? 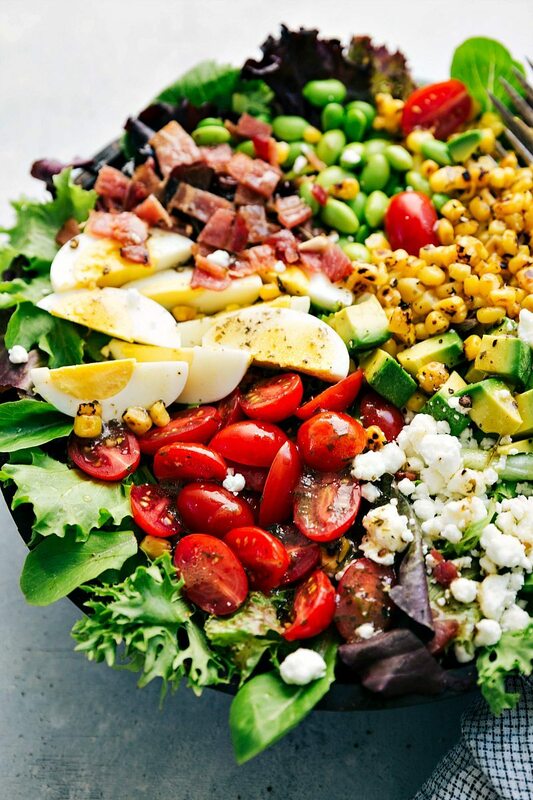 It all depends on what you put on your cobb salad! The version I’m sharing today is definitely on the healthier sides of Cobb Salads. The biggest determining factor on if a cobb salad is healthy or not is the dressing you choose to use. A full-fat blue cheese dressing will add tons of fat and calories while an olive oil based vinaigrette is a much lighter option AND has healthier fats. Not all fats are equal — if you’re using olive oil you’re getting MUFAs (monounsaturated fatty acids). MUFAS are considered healthy dietary fat (and very needed in a balanced diet). If you replace saturated and trans fat (typically present in a blue cheese dressing) with MUFAS you can gain many health benefits. What is the dressing on a Cobb salad? So now that we’ve talked a little bit about the health benefits of choosing a dressing for this salad, what is the dressing on a cobb salad? Well this one is a delicious and slightly tangy herb vinaigrette. We’re mixing tons of fresh herbs with olive oil, red wine vinegar, garlic, dijon mustard, a little sugar (to balance acidity), and of course some salt and pepper. You’ll blend the dressing together and add right it to the salad right before eating. 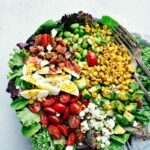 If you’re interested in a more traditional Cobb salad, you can grab a good store bought blue cheese dressing (usually found in the refrigerated produce section) or try out this recipe! What is in the Chick fil a Cobb Salad? The Chick-fil-A salad is topped with their famous nuggets (sliced up) on top of Romaine lettuce and baby greens, shredded red cabbage and carrots, roasted corn kernels, a cheese blend including cheddar cheeses & Monterey Jack, crumbled bacon, diced eggs, grape tomatoes, and charred crispy red bell peppers. You can choose the dressing for this salad — typical recommendations are either the Fat Free Honey Mustard dressing or their Avocado Lime Ranch dressing. Blend in the buttermilk and serve over the salad! Can I add chicken to your Cobb Salad Recipe? YES! In fact, we typically add some grilled chicken to this salad! What I like to do is take about 1/3 of the dressing recipe and pour it in a large plastic bag. Add a few chicken breasts, toss together in the bag, and store in the fridge. Just like that you’ve got your chicken marinating! When you’re ready to eat, you can drain off that marinade (and discard), grill the chicken, and serve it (slightly cooled off) on the salad. Using the dressing to marinade the chicken in, really gives you some good flavorful chicken for this cobb salad. To make the dressing: (see note) add the red wine vinegar, dijon mustard, garlic, parsley, cilantro, salt and pepper (I use about 1/2 teaspoon each), and sugar to taste (add slowly to personal preference!). Blend until smooth and then whisk in the olive oil. (Don't blend in the olive oil). Taste and adjust to personal preference (salt, pepper, sugar). To grill the chicken: remove the chicken from the bag and discard the marinade. Cook on a grill (or in a pan) over medium-high heat for 4-5 minutes on each side until the juices run clear. Remove the chicken from the grill and tent with foil. Let it rest and cool a bit for about 10 minutes and then slice or chop into bite-sized pieces. Prepare remaining salad ingredients: place the lettuce in a large bowl (or divide evenly between plates). Peel and dice or slice the hard boiled eggs (see below for cooking instructions), cook and crumble the bacon, shell the edamame, halve the grape tomatoes, dice the avocado, and prepare the corn (drain from can, grill fresh corn, or thaw frozen corn). I like to squeeze some fresh lemon over the avocado to keep it from browning and give it a fresh tangy flavor. To serve salads: divide ingredients evenly on top of each bed of lettuce. Add feta or goat cheese. Drizzle dressing right before eating (do not dress anything you want to keep leftover as the dressing doesn't sit well with this salad). Place eggs in a large saucepan/pot. Cover them with cold water by 1 inch. Cover pan with a lid and bring the water to a rolling boil over high heat. Once the water has reached a boil, set the timer for 6 – 7 minutes and continue to boil over medium-high heat. Using a slotted spoon, transfer them to a large bowl with ice cold water and let them cool for a couple of minutes. (Or place under cold running water). Peel the eggs and chop or slice for this salad! *I've included the option to add some grilled chicken to this salad. If you want to add grilled chicken, make the entire dressing recipe and use 1/3 of the dressing to add to the grilled chicken. If you don't want the chicken, you can halve the dressing recipe (or make it all and store in an airtight container in the fridge for 1 week). 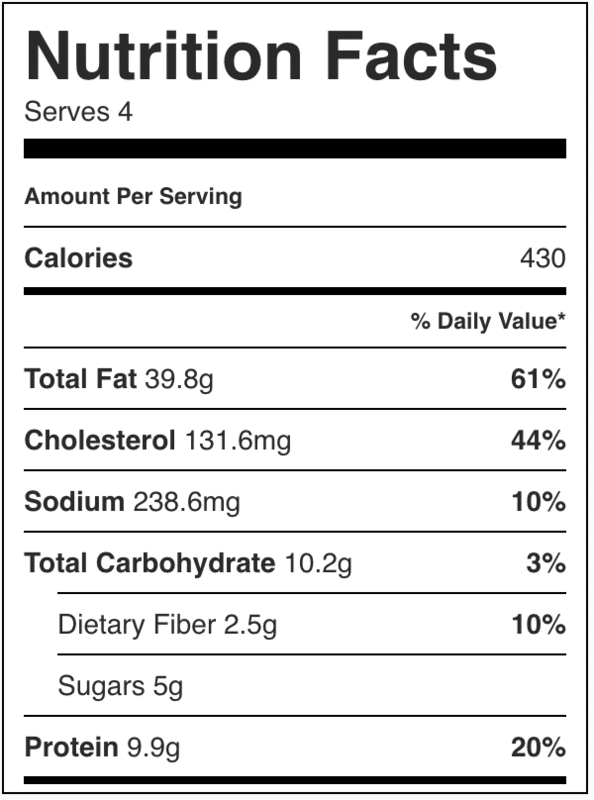 Nutrition facts assume full dressing recipe (which likely won’t all be used or will partially be discarded if you use for the chicken marinade) and no chicken. I’m a sucker for a good salad; It’s all we’ve been eating for dinner lately. I’m excited to try this one! Thanks for sharing this recipe! I’m always looking for fresh and healthy salads to put in my lunch box. Looks like this fits the bill. Thanks! This is absolutely the best salad my husband and I have ever had. It’s a weekly request in my household!